Many hobbyists can recall the specific point in their lives that a vehicle made a lasting impression upon them. To some, it was entering a showroom and beholding a curvaceous sight, while to others, it was the first time they spied their dream car peacefully cruising a street or highway. Then there are those who revel in the days when high-performance cars blazed the countryside, leaving the smell of rubber and high-octane fuel, and the bellowing tone of large-cube V-8 power in their wakes. Herb Patton is one hobbyist who relates to the latter. The 60-year-old product-support-representative retiree grew up in Crete, Nebraska, a small town about 25 miles southwest of Lincoln. Though Crete's population back then was just 3,500, it boasted of two dealerships: Muff Pontiac and Jack Applebee Chevrolet. The pair supplied the area with an amazingly high number of vehicles for their sizes. "I was only 13 years old at the time, but it seemed there was drag racing every night, whether on Crete's streets or at nearby dragstrips in Kearney, Lincoln, and Omaha," recalls Herb. "I remember seeing the new '62 Pontiacs and falling in love with the styling. There were several high-performance Grand Prixs and Catalinas running around, and I watched them win regularly. It was a great time to grow up." 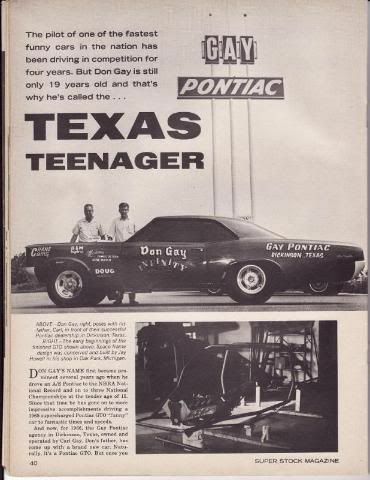 Herb was about the same age as Don Gay of Dickinson, Texas, and though the two had never met, the excitement of watching the early-'60s Pontiacs thump the competition appealed to both. Unlike Herb, Don's father, Carl, owned a Pontiac dealership and let Don begin racing locally with a '58 Pontiac in 1961 at the young age of 14. The dealership's service manager, James Osteen, told Herb, "Don was only 14 when he started racing, so I let him drive on my license to start with." With appropriate credentials in hand, Don took to the dragstrip, but it quickly became apparent that he didn't yet possess enough skill to win. He lost each match race he entered with the '58. Hayden Proffitt was an accomplished racer that Mickey Thompson employed to drive his Pontiacs during the early '60s. It proved a lethal combination. So lethal in fact, that during his tenure at Thompson Enterprises, Hayden took five '62 Pontiacs to the NHRA Winternationals at the Los Angeles County Raceway in Pomona, California, that year and won five different classes with them: A/FX, Super-Super/Stock, Super/Stock, A/Stock-Automatic, and B/Stock-Automatic. Just a year earlier, Hayden was traveling cross-country attending events with his '61 Catalina. He recollects, "I was asked to make a publicity stop at Gay Pontiac to display the car and meet the Gay family. Carl asked if he could hire me to teach Don to drive and I agreed. Don was only 15 at the time, but he was a good listener and caught on very quickly. He turned out to be an excellent driver." Carl's investment paid off, as his son won his first trophy the following race. Pontiac's Super-Duty program of the early '60s was stealing the show at NASCAR circle tracks and NHRA dragstrips everywhere. The largest engine displaced 421ci, and its 4.09-inch-bore block was fitted with forged-aluminum Mickey Thompson pistons, 6.625-inch forged-steel connecting rods, and a forged-steel crankshaft with a 4.00-inch stroke and 3.25-inch diameter main journals. The engine was fed by a pair of Carter AFB four-barrel carburetors, a cast-aluminum intake manifold, and in 1962, high-flow No. 127 cylinder heads featuring 2.02/1.76-inch diameter intake and exhaust valves. A McKellar No. 10 mechanical flat-tappet camshaft with 308/320 degrees of advertised duration and 0.445-inch valve lift with 1.65 rockers actuated the valves. Spent gases were exhausted through a pair of high-flow cast-iron manifolds with bolt-on collectors that could be uncapped for competition. Now those were the days! I get to see alot of the early '60s cars run in the Nostalgia Super Stock series, and I love watching them run. Those 405-410 HP Tri-Power 421s were some stout motors! Glad your dealership was around then and now! 2009.5 G8 GXP WH 6M onyx/red no roof 12.921 @ 108.89 BONE STOCK! (then), 12.344 @ 110.92 with 1.688 60' at 766' DA, PB with new cam & tune - 12.191 @ 112.35 with 1.693 60' at 1319', 2:59 lap time at Road America on RS-As, 143.1298 mph NoFlyZoneMidwest 2017 1/2 mile into 20 mph headwind. RACECAR NOW RETIRED. All of these are final PBs. VCM OTR CAI, HSRK, Heater Hose Relocate, custom street/dyno tune by oldskoolgp, Comp Cams 224/228 .581"/.588" 112 LSA cam, LS7 lifters, PAC 1219x springs, Monster LT1S (C7 Corvette) Clutch kit, Katech C6 Hvy Dty Master & Slave Cylinders, Camaro 1LE Diff with 3.91 gears, Kooks LTHs, Solo Hi-Flo Cats & Connector Pipes, Solo Mach Balanced Catback, BMR Toe Rods, Trailing Arms, Cradle & Diff Poly Bushings, 2017 Chevy SS front & rear Brembo calipers and rotors. yea, it was amazing to read the article in this month's issue of High Performance Pontiac! And to recognize the dealership name as one of the approved dealers on this board... even better! Glad that we were able to post it up, Nino! Thanks! Now the big questions, why oh why did the dealership sell off such a beast that should have been a showroom staple. And what is Don up to today. They sold it a long time ago when they were still racing funny cars and never thought they would be out of racing. The guy tried to sell the car back and wanted some ridiculous figure. The car may have some value to the Gay family, but as a collector is worth not much more than any other catalina of the same year. The 405-410 HP 421s were SDs and had dual quads (2x4BBL). 421 HOs were tripowers but rated at a lower 370 HP. 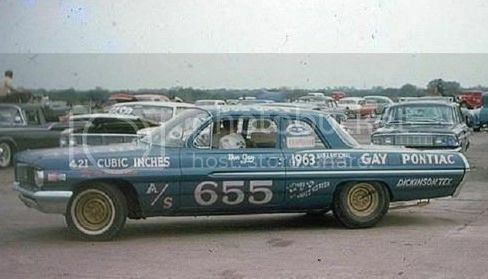 Back in those days it was all about exposure for Pontiac and the best exposure was winning at the track. The SD Catalinas were pretty much doled out to racers. (My Dad did know a guy back in the day that purchased an SD new for use on the street though) The old adage "win on Sunday sell on Monday" was very true in the 60s. They guy may not have been far off in what he was asking. You may want to check into what SD Catalinas sell for these days...They are into the 6 figure range. There were only 179 built in 1962 so they are much more rare than the G8 GXP! Once in a while they come across the auction blocks at such auction houses as Mecum and Barrett Jackson and are highly desireable. Pontiacs just now are getting mainstream recognition with collectors like the Hemi Mopars did a few years ago and that is driving their values up as was the case with anything with a "Hemi". Last edited by tripower; 07-16-2009 at 11:44 PM. They guy may not have been far off in what he was asking. You may want to check into what SD Catalinas sell for these days...They are into the 6 figure range. There were only 179 built in 1962 so they are much more rare than the G8 GXP! They come across the option blocks such as Mecum and Barrett Jackson and are highly desireable. Pontiacs just now are getting mainstream recognition with collectors like the Hemi Mopars did a few years ago and that is driving their values up as was the case with anything with a "Hemi". 6 figures would be reasonable compared to what I hear he was asking.... We are talking Enzo numbers from what I was told. Old enough to remember the Gay Racing Catalinas, too. Last edited by 4DCYKEY; 07-16-2009 at 07:40 PM. Then that was extortion! Funny you mention the Enzo...There's a local SoCal gathering every Saturday at the Ford PAG building and a real Enzo rolled in this past week. Nino, you have been given some inaccuarate information about the car and it's current owner. It is NOT as you have suggested, that "Enzo" numbers have been asked for the car. In fact, the car has NEVER been offered for sale by the current owner to anyone, and a price has never been placed on it. The current owner of the Gay Pontiac 62 Catalina is a personal friend of mine. He has told me about his interaction with the Gay family. I would encourage you to ask Don Jr, or Shane or even Marie about this car before you make critical comments about the owner of the car and what has been discussed between them. He and the Gay's have a good relationship, and they have shared with him much of the memorabilia about the car including one of the championship trophies won by Don Sr. The car was owned for many years by a man in Minnesota who had raced it and kept it in its original condition except for the paint and lettering. It was even published in Pete McCarthy's book "Pontiac Musclecar Performance" that it was in Minnesota and who the owner was. The owner knew what the car was but was never willing to sell it. About two years ago, the long time Minnesota owner passed and his heirs put the car up for sale. My friend was the successful buyer of the car and the parts to put the car back to it's "as raced" condition. The current owner has returned the car to it's 1962 configuration. He has not done the much more common "restoration" that has been done to many of these valuable factory race cars that in my opinion makes them less desirable. This car is driven on race tracks. It is not a trailer queen. I have ridden in this car, it is an experience to enjoy. The current owner is fair and honest man. He has told the Gay family that he has no plans to sell the car, but that if he does ever decide to sell it, they will have the first opportunity to buy it. Again, ask Don Jr. or Shane. They know what has been said. Please, know the facts before you post information on the internet for all to see. Your statement: "but as a collector is worth not much more than any other catalina of the same year." clearly says that you have no idea what a 421 SD Catalina is, or any idea of it's value. So keep selling those NEW Pontiacs while you can, that is something you do know about. Last edited by car guy; 07-17-2009 at 07:32 PM. Here is another nice article with a photo of Don in his younger years! Sorry to hear that he has passed away. I'm trying to get a better scanned copy of the entire article. If I do, I will email it to you. By the way, I'm really enjoying the SBM GXP! Awesome car. 1974 Firebird Formula 455, Fire Coral Bronze, Saddle Interior. Auto, Numbers Matching. Owned its twin back in 1975. Both from same dealership. loved those old big car ponchos. I remember growing up for a family car we had a 68 grand prix with a 428. I was too young to drive then, but my brother raised a lot of hell in that car. The G8 brings back a lot of what Pontiac used to have in those days. At least Pontiac is going out on a high note. Does any one know what color Dons car was in 1964? The article says it was ensign blue. But that seems darker then this picture I found of it.